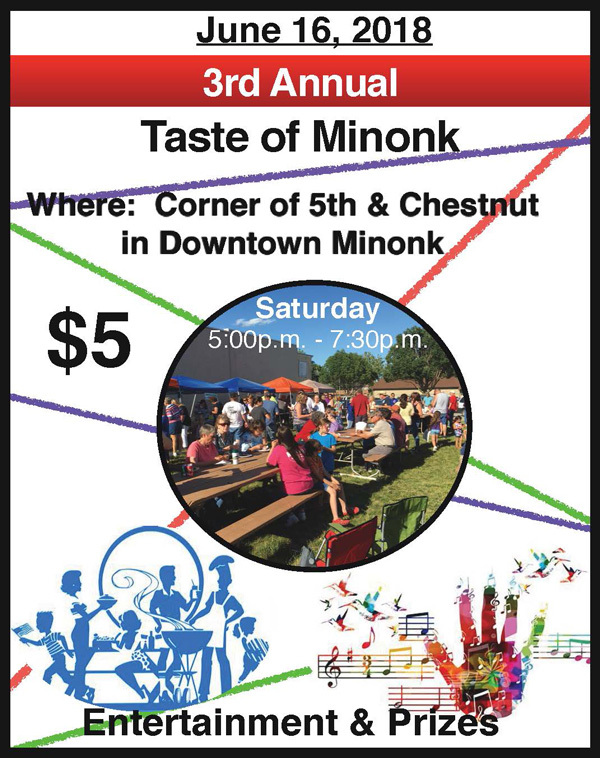 The 3rd annual Taste of Minonk will be held this Saturday, June 16th, from 5:00 pm to 7:30 pm at the corner of Fifth and Chestnut streets in downtown Minonk. Food will be provided by six Minonk vendors. $5 will give you a ticket to sample food from all the vendors. In addition to the food, there will be musical entertainment, face painting for the kids and chalk will be made available to kids wanting to do some sidewalk art. There will also be a kids train from Peoria to provide rides. There will be a raffle for prizes that include a television, 2 bicycles and a folding bench/table. Tickets must be purchased and turned in prior to 7:00 pm to be eligible for the drawing and you must be present in order to win a prize. Tents will be put up to provide shade. People are encouraged to bring their own lawn chair. At 8:30 pm there will be a movie at the site featuring "The Goonies". It is a great time to get together with friends and family. See you at the Taste of Minonk on Saturday.